Whether you are new to a plant-based vegan diet, have been plant-strong for a while, or just stumbled upon my blog out of curiosity, you’ve probably wondered how to stock your pantry and fridge with foods that are the most beneficial for your health. So what are the essentials that can be found in pantries of almost all vegans? And is it true that you’ll have to start cooking at home, even if you’ve never been a fan of it? Yes, it’s a well-established fact: if you want ‘thy food to be thy medicine’, as Hippocrates proposed, you’ll have to cook the majority of your meals at home from whole, fresh ingredients, takeout be damned. If your average at-home cooking adventure used to include microwaving a store-bought frozen pizza, and now you’ve decided to become a vegan out of health concerns, you’ve probably noticed that there are very few options of premade plant-strong vegan dinners in grocery stores, and restaurants you used to love don’t seem to be very accommodating. As always, I can’t leave you hanging without any good news: if you find a few easy vegan recipes and try making them at home, you might find that cooking is actually a lot of fun! I’ve heard multiple stories about people who used to hardly ever cook at home, and when they switched to a vegan diet, they found cooking so awesome that they ended up creating wonderful vegan food blogs and even publishing cookbooks! Okay, not all of us are superhuman to do all that, but we all can make an attempt to be a little healthier, right? Today I’m going to help you out a little with a list of great vegan pantry essentials. If you stock your pantry and fridge right, cooking any newly found recipe will become easier as you won’t have to run to a store to buy whatever the recipe calls for. By the way, if you still think that cooking healthy vegan meals is too much hassle, check out this post with 10 super-easy plant-based meals that can be put together in no time. What’s In The Vegan Pantry? Let me clarify right away: my definition of ‘vegan’ includes consuming the healthiest plant-based foods with little to no junk of non-animal nature. The closer to their natural state the ingredients are, the better they are for us. Cooking food at home from scratch always allows you to control what you are putting in it, thus giving you a chance to make it as healthy as possible. Many people agree that it is easy to be an unhealthy vegan if you live on potato chips, soda, Oreo cookies (did you know that they are technically vegan? ), and other processed store-bought foods. We have a different goal here: to make our vegan diet the healthiest it can be! So here’s a list of pantry essentials that can do a lot of good for our health. Most of them can be found in your local health food stores, grocery stores, and online. Benefits. This plant-strong pantry essential is a great addition to any diet: flax seed is full of omega-3 fatty acids, fiber and antioxidants. A tablespoon of ground flax has 1.8 grams of plant omega-3s. Flax has a very high amount of lignans that have plant antioxidant and estrogen qualities – between 75 and 800 times more than any other plant food! To reap all of the benefits of flax seed, you need to grind it up in a coffee/spice grinder (our bodies don’t break down whole seeds efficiently), or buy preground flaxseed meal, like this organic ground flaxseed by Bob’s Red Mill. 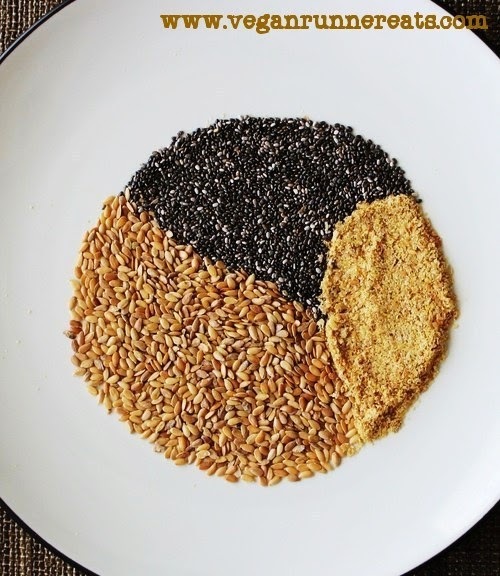 This image shows (clockwise from top) chia seeds, ground flaxseed, and whole flax seeds. To Use It: add ground flax to dough and batters when baking; sprinkle over breakfast cereal or add to smoothies; make ‘flax egg’ – an all-natural vegan egg substitute in pancake/waffle/baking recipes – by combining equal amounts of ground flax and water (recipes usually have guidelines for that). This rather interesting ingredient is not just for hippies anymore! Benefits: chia seeds contain high amounts of omega-3 fatty acids, fiber, antioxidants and minerals (phosphorus, calcium, magnesium, manganese). British scientists have published a study in which consumption of chia has shown a reduction in the amounts of blood triglycerides and cholesterol levels while increasing the amounts of HDL (‘good’) cholesterol. When mixed with water, chia seeds turn into a gel-like substance. Some studies suggest that this chia jelly absorbs toxins from our intestines when going through our digestive tract, thus removing them from our system. Chia seeds are becoming a common staple in grocery stores these days, plus you can always find a good selection of chia online, including some certified organic varieties like these chia seeds from Navitas Naturals. To Use It: chia seeds can be added to cereals, sprinkled on wraps, sandwiches, soups, salads etc. Chia is great for baking: just like ground flax seed, it can be used as an egg substitute when mixed with water. Unlike flax, chia doesn’t need to be ground up to release its nutrients inside our bodies. Benefits: contains 18 essential amino acids, thus being a complete protein; has 15 minerals such as chromium, manganese, copper, vanadium, molybdenum and lithium; is rich in B vitamins, with some brands being enriched with vitamin B12 (the only vitamin that vegans might get deficient in on an otherwise balanced plant-strong diet); maintains good intestinal environment; improves liver health and function; aids in balancing cholesterol levels; promotes healthy skin. How did we ever live without this stuff? 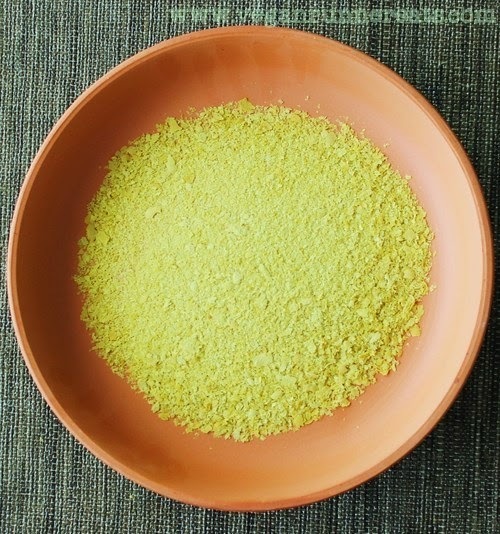 When choosing nutritional yeast, it’s best to opt for a brand that fortifies it with vitamin B12 (some people may become deficient in B12 after following a vegan diet for a while). Both Bob’s Red Mill and Red Star fortify their nutritional yeast with B12. To Use It: thanks to its natural cheesy flavor, nutritional yeast is a great ingredient in vegan cheesy sauces (vegan mac’n’cheese recipes are a good example). It can be also sprinkled over just about any entrée or soup for an extra kick of flavor. Some open-minded people even mix it with blackstrap molasses and eat it by the spoonful! Benefits: great sources of plant protein, fiber, complex carbohydrates (the ones that don’t cause your blood sugar to spike), essential fatty acids, potassium, iron, calcium, and folic acid. Beans and lentils promote digestive health: they are a great food for the good bacteria that live in our intestines. They also prevent polyps from forming in our intestinal tract, thus reducing a possibility of developing colon and rectal cancer. Lastly, beans and lentils are very cheap and filling! 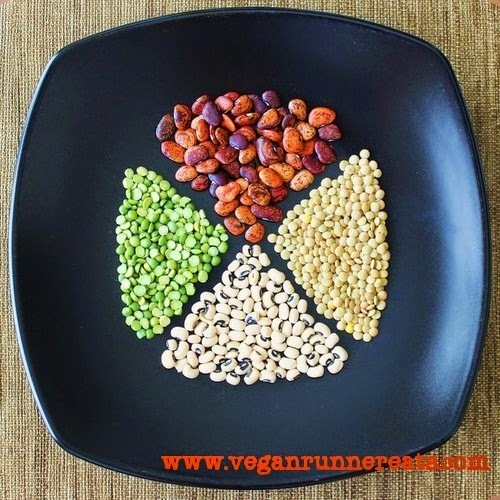 This picture shows (clockwise from top) speckled butter beans, green (brown) lentils, blackeye peas, and green split peas. To Use Them: beans of all forms and shapes have been used in many world cuisines for thousands of years! A lot of delicious recipes from Mexican, Indian, African and Middle Eastern cuisines include beans and lentils. You can use both dried and canned beans from the store, or purchase certified non-GMO beans in bulk online, like these garbanzo beans from Palouse Brand. If using dried beans, soak them for at least 4 hours or overnight in water, then drain them, and boil until soft, 30-60 min depending on the variety, adding salt (or not) at the end. If buying canned beans, look for the low-sodium varieties; drain and rinse them in cold water and use according to a recipe you’re using them for. Also, check out this post about cooking dried beans. Tomatoes are considered one of the healthiest fruits and vegetables known to us! You’ve probably heard that they are technically a fruit, not a vegetable. Using (BPA-free) canned tomatoes is easier when they are not in season. Benefits: tomatoes are a great source of lycopene – a powerful antioxidant that does wonders to our health, from fighting free radicals to promoting strong bones. Tomatoes also have a number of vitamins (C, A, and K) and minerals (potassium, folate, magnesium, copper). Their consumption has shown a decrease in cholesterol and triglyceride levels in our bodies. To Use Them: A lot of dishes from all over the world call for tomatoes. My pantry is always stocked with diced tomatoes, tomato paste and sauce (San Marzano tomatoes are my favorite); it’s also good to have crushed and fire-roasted canned tomatoes on hand. Aim for no-salt-added varieties at the store. Of course, when tomatoes are in season, it always makes sense to use them instead of their canned versions! By the way, the levels of lycopene in cooked tomatoes are higher than in fresh ones. Benefits: a great source of carbohydrates to provide us with lots of energy, a number of B vitamins (thiamin, riboflavin, niacin, folate), and fiber. Historically, many great civilizations used some types of grains as their staple foods: barley in Middle East, corn in Central and South America, millet and sorghum in Africa, and rice in Asia. Consuming whole, minimally processed and even sprouted grains is more beneficial to our health than eating their processed versions because more nutrients and fiber are available in whole grains. However, billions of people in Asia have been consuming mostly white rice for centuries, and have had no problems with obesity or diabetes until recently, when Western-type food became more available to them. The conclusion: aim to consume whole grains, but don’t shun white rice completely. 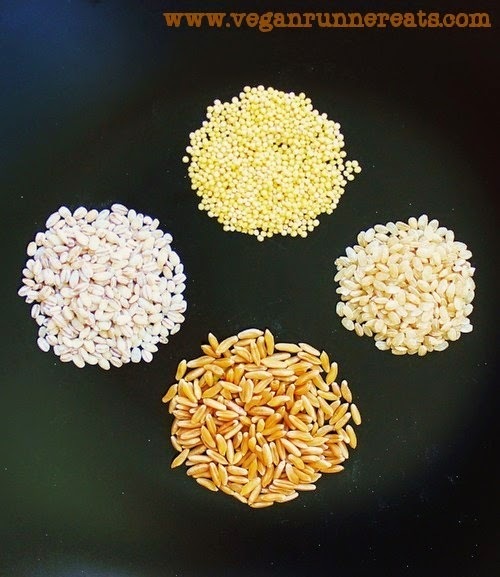 Pictured here (clockwise from top): millet, brown rice, kamut, barley. To Use Them: to reap the most health benefits of grains and to fuel your body (especially if you are athletic), aim to add a variety of whole grains, such as barley, oats, brown rice, whole wheat, kamut, etc. to your diet. Bob’s Red Mill sells a large variety of grains both in stores and online. If you are gluten-intolerant, choose gluten-free grains such as rice, corn, sorghum, and millet. Experiment with sprouting: it’s very easy, but can increase the amount of available nutrients in sprouts up to 10 times compared to the same non-sprouted grains. Sprouting technically converts grains into vegetables. 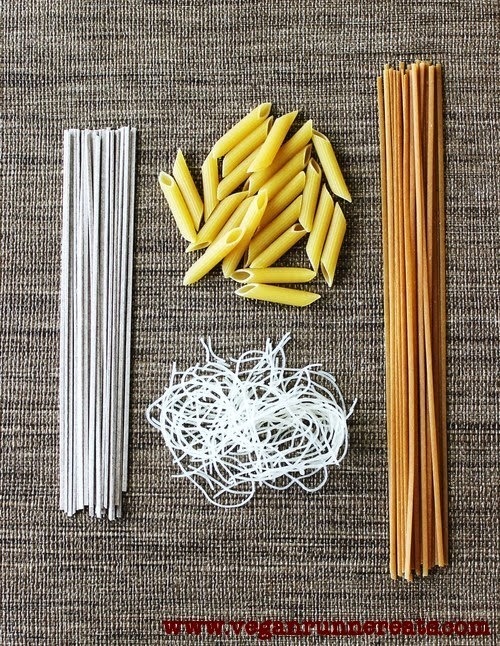 These pastas have similar benefits as the whole grains described above, especially when made with minimal processing techniques. A variety of pastas can add some oomph to your diet and lets you explore different world cuisines, from Italian to Thai and Japanese. This picture (clockwise from top) multigrain penne and whole wheat linguine pasta from Italian cuisine, and rice vermicelli and Japanese buckwheat soba noodles from Asian cuisines. To Use Them: shop for whole wheat, quinoa, amaranth, rice, and soba (buckwheat) pastas and noodles. Try sprouted pasta, like this Ezekiel 4:9 Organic Sprouted Penne pasta. Experiment with sauces and add vegetables and beans or tofu to create delicious vegan meals inspired by various cuisines of the world! Benefits: contain good amounts of healthy mono- and polyunsaturated fats, plant protein, and fiber. 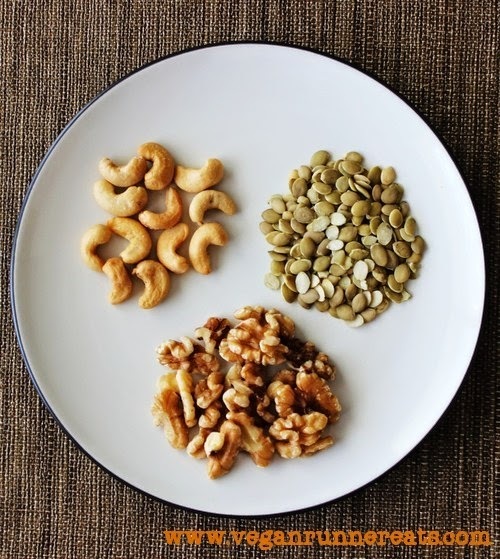 Nuts and seeds also nourish us with a number of minerals, such as magnesium, calcium, zinc, and phosphorus. Raw pumpkin seeds are high in iron. Due to a relatively high amount of fats found in nuts, they should be consumed in moderation (a small handful, or about 1 oz a day). Aim to include a variety of nuts and seeds in your diet to provide your body with different nutrients, and pick raw/minimally processed ones with no added salt. Pictured here (clockwise from right): raw pumpkin seeds a.k.a. pepitas, raw walnuts, roasted cashews. To Use Them: chop them up and add to your morning cereal; add a handful to batters and dough when baking; enjoy as a snack – but watch the serving size! Experiment with making your own nut butters: homemade nut butters tend to be much healthier than store-bought ones because you know exactly what ingredients you used. Raw, unprocessed nuts and seeds can be sprouted just like grains – this technically turns them into vegetables! Before I hear ‘Whaaat? !’, let me introduce you to a somewhat new for us Westerners, but a very common in Asia group of these vegetables : kombu, wakame, nori, hijiki, arame, and kelp. You might be a little more familiar with them if you like sushi. Benefits: sea vegetables have one of the broadest varieties of minerals available among any foods. They are an excellent source of iodine and vitamin K, a good source of magnesium, calcium, riboflavin and folate. Sea vegetables contain the type of iron that is more bioavailable to us than the types found in other vegetables. They contain a different source of antioxidants than other vegetables, and are rich in phytonutrients. To Use Them: the above named sea vegetables are widely used in Asian (especially Japanese) cuisines. At home, we can use nori sheets to make sushi rolls, or sprinkle powdered kelp on entrees for a boost of nutrients. Kombu strips are great for cooking beans: a 1-2 inch strip added to a pot of beans (or a soup) reduces their cooking time, enhances flavors, thickens the broth, and even makes beans more digestible to prevent gas! 10. A Variety of Spices. Using spices in cooking is a great low-calorie way to add lots of flavor to any dish! Spices allow you to explore cuisines from all over the world without leaving your house! A lot of spices have numerous health benefits, especially when it comes to delivering antioxidants! Cinnamon, for example, is known for its ability to prevent blood sugar spikes if you consume it with sugar and carbohydrate-rich food. Capsaicin in hot chilies and cayenne pepper promotes heart health, pain relief, and may aid in cancer prevention. Indian cuisine is hard to imagine without turmeric: it helps with digestion of fiber-rich foods (especially with beans in them), and also aids in reducing inflammation, especially in arthritis patients. To Use Them: it’s hard for me to imagine my pantry without cumin, cinnamon, turmeric, chili powder, paprika, thyme and oregano! I also have a few pots of fresh herbs on my balcony (currently I’ve got basil, sage, rosemary, and dill). Italian and Indian dishes are especially big on using certain spices. My advice: get a good variety of spices in a bulk section of your local health food store, and include both ground and whole-seed versions (the latter is for cumin, celery, and fennel seeds). Avoid pre-mixed spice bottles that contain salt and other additives, and always stay away from mixes that contain monosodium glutamate (MSG)! To make a conclusion, I’d like to emphasize that it’s very important to use lots of fresh or minimally processed fruits and vegetables in addition to all the foods listed above. My other refrigerated vegan staples include non-dairy milk, tofu, and tempeh; my pantry also has dried fruit, brown sugar, blackstrap molasses, maple syrup, and agave nectar. As you find more and more vegan recipes, you’ll discover even more healthy and delicious ingredients to add to this list!